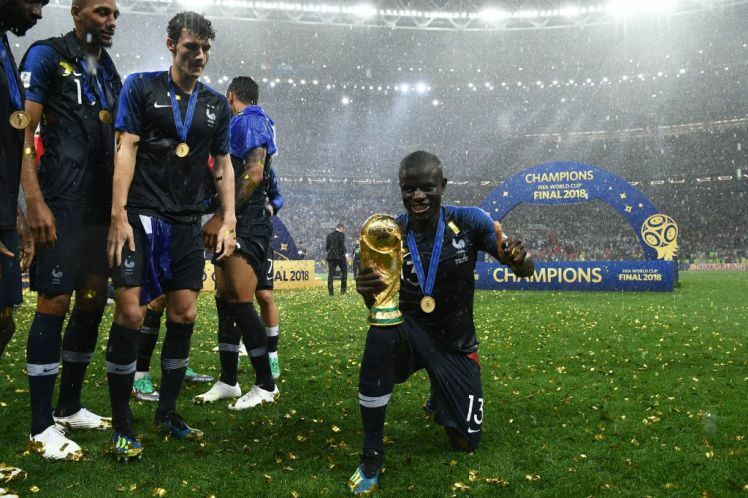 He was uncharacteristically out of sorts against Croatia in the World Cup final but France simply wouldn’t have reached that stage without N’Golo Kante. The diminutive Chelsea star was hooked in the 54th minute after receiving a yellow card but the France squad appreciated the role he’d played in getting them there and sung his name long into the night afterwards. The 27-year-old was a virtual unknown before he joined Leicester City in 2015 but he spearheaded the Foxes’ remarkable Premier League triumph and became the first player to win back-to-back titles with different clubs by inspiring Chelsea in the following season. Despite his achievments, Kante has managed to remain ridiculously modest – making him even more loveable. However, he took his humble nature to the next level on Sunday when he was too shy to ask to hold the World Cup trophy that he played such a crucial role in winning in Moscow. According to Get French Football, Sevilla midfielder Steven N’Zonzi noticed that Kante was hanging around in the background of the team’s celebrations and sought him out to hand him the trophy. N’Zonzi, who is wanted by Arsenal, can be seen retrieving the trophy from former Newcastle ace Florian Thauvin and gives it to Kante – who was looking completely the other way. Kante only made his France debut at the age of 25 but he’s been one of the first names on the teamsheet under Didier Deschamps.